Last month thousands of superintendents and other golf course professionals descended upon San Antonio, TX for the annual Golf Industry Show. GIS represents the premier event for the golf industry and 2018 was one of the best shows yet. The week was jam-packed with educational events and lectures capped by two days of trade show exhibitions at the Henry B. Gonzalez Convention Center, where visitors learned about the latest and greatest technologies in the industry. One of the highlights of this year’s show was #GCITweetUp18, featuring the 2018 Super Social Media Awards. The annual TweetUp, co-hosted by Aquatrols and Golf Course Industry Magazine, brought together hundreds of superintendents from the social sphere to mingle over a few cold ones and recognize the social media superstars from the past year. The TweetUp concluded with the presentation of the inaugural Aquatrols Conservation Award to Paul Carter, CGCS of Bear Trace at Harrison Bay. 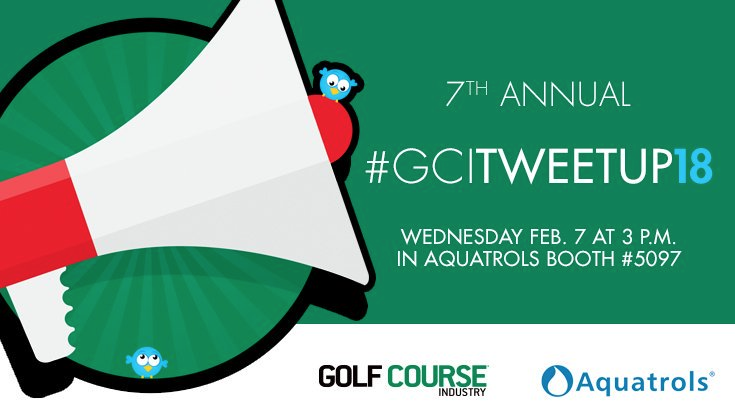 Aquatrols congratulates all of the 2018 Super Social Media Award winners and extends our sincere gratitude to everyone who made #GCITweetUp18 a smashing success. We look forward to sharing more social moments with you throughout the 2018 season! Join the conversation! Be sure to “Like” us on Facebook and follow us on Twitter! Aquatrols is the world leader in the development of cutting-edge soil surfactants and other specialty technologies used in the professional turf, ornamental, and agricultural industries.